James Long and many of the residents in the Natchez area were unhappy over the Adams-Onís Treaty, in which Spain gave Florida to the United States in exchange for the boundary of the Louisiana Purchase being drawn at the Sabine River. Originally they expected, and even Thomas Jefferson stated, that the boundary should be the Rio Grande, which would have made Texas part of the United States. Citizens of the United States had already made several filibustering attempts to wrest Texas from Spain, when James Long in 1819 was named commander of an expedition financed by subscriptions totaling about $500,000. Over 300 young men volunteered, expecting to receive a league of Texas land in exchange for their service. When James Long left for Texas, Jane was expecting a baby and remained behind with their eighteen-month-old daughter, Ann. The second girl, Rebecca, was born on June 16 and twelve days later Jane left hurriedly with both children and Kian, her young slave girl. By the time they reached Alexandria, Louisiana, Jane was sick. She left both children and Kian with friends and plunged on, finally reaching Nacogdoches in August. The citizens of Nacogdoches had declared the independence of Texas, organized a provisional government, and named James Long its chief. Supplies did not arrive as expected from Natchez, and Long made a fruitless attempt to persuade the pirate Jean Laffite, who occupied Galveston Island, to provide supplies and men for the expedition. Finally in October Spanish authorities sent more than 500 troops to Nacogdoches to drive the Long Expedition out of Texas. As they fled to Louisiana, the Longs learned their baby, Rebecca, had died. Undeterred by his failure, Long organized a new expedition and by March 1820, he took Jane, their daughter Ann, and the slave girl Kian with him to Bolivar Peninsula, a spit of land extending into Galveston Bay across from the eastern end of Galveston Island. Long organized his forces at Fort Las Casas on Point Bolivar and apparently continued to court the elusive Jean Laffite. In later years, when Jane recounted her experience on Bolivar Peninsula, she claimed that she dined privately with Laffite in an effort to get his support for her husband’s expedition. She also said that she made a flag, which she called “the lone star” for Long’s troops to carry with them. Finally in September 1821, Long and fifty-two men sailed to La Bahía (present Goliad) with plans to capture the town. In the meantime, Mexico had won its independence from Spain and had no intention of allowing citizens from the United States to capture Texas. After holding La Bahía for only four days, Mexican forces overpowered Long’s troops and they were taken as prisoners to Mexico City where Long was killed about six months later. Jane, who was expecting another baby, promised James that she would wait with several others families at Fort Las Casas on Bolivar Peninsula. After a month of waiting for Long and his men to return, the food supplies began running low, and the Karankawa Indians in the area were becoming increasingly unfriendly. The families began to leave, but Jane insisted on waiting for her husband until she, her daughter Anne and Kian were all that remained at the fort. With the help of Kian, Jane gave birth to daughter Mary James on December 21, 1821, at a time when it was so cold that Galveston Bay froze. In early 1822, as their food supply dwindled to almost nothing, an immigrant family arrived, and Jane reluctantly moved with them up the San Jacinto River. That summer she received word that James Long had been killed. She returned to Louisiana, but after Mary James died in 1824, Jane Long returned to Texas and received a league of land in Stephen F. Austin’s colony. 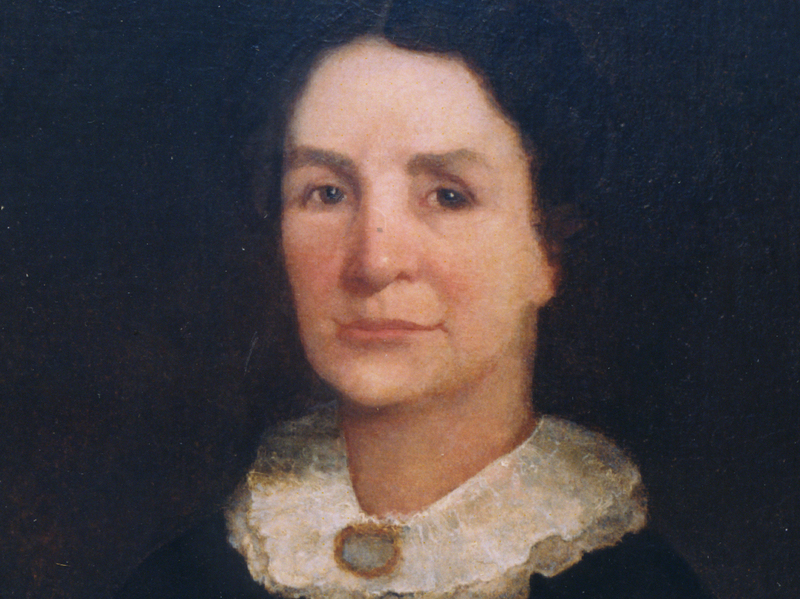 Family tradition says that Jane was courted by many of Texas’ leaders including Stephen F. Austin, Sam Houston, Ben Milam, and Mirabeau B. Lamar, but she refused all their proposals, apparently remaining loyal to James Long—the love of her life. After living several years in San Felipe, the headquarters of Stephen F. Austin’s colony, she opened a boarding house in Brazoria. The Bolivar Peninsula Cultural Foundation, which maintains Jane Long’s memorabilia, states that Jane held a ball at her boarding house in Brazoria when Stephen F. Austin returned in 1835 from prison in Mexico. It was at the ball that Austin made his first speech favoring Texas independence from Mexico. The foundation claims that during the Texas Revolution in 1836 Jane fled Brazoria ahead of the advancing Mexican Army and that she saved the papers of Mirabeau Lamar, which included his original history of Texas. In 1837, at the age of thirty-nine, Jane Long moved to her league of land, part of which she sold to developers for the town of Richmond. 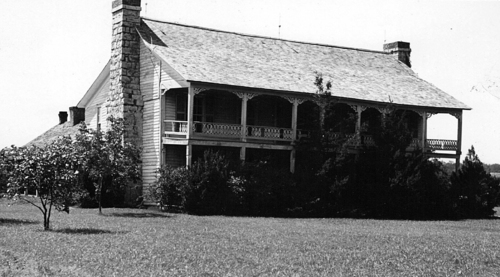 She opened another boarding house and ran a plantation with the help of twelve slaves. At the beginning of the Civil War, she had nineteen slaves and 2,000 acres valued at $13,300. After the Civil War, she worked her land with tenant farmers. When her daughter Ann died in 1870, the value of Jane’s estate had diminished to $2,000. 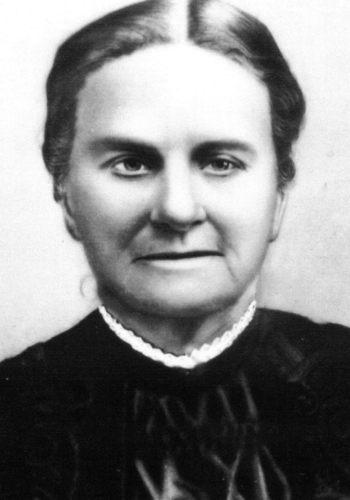 Jane Long died at her grandson’s home on December 30, 1880. 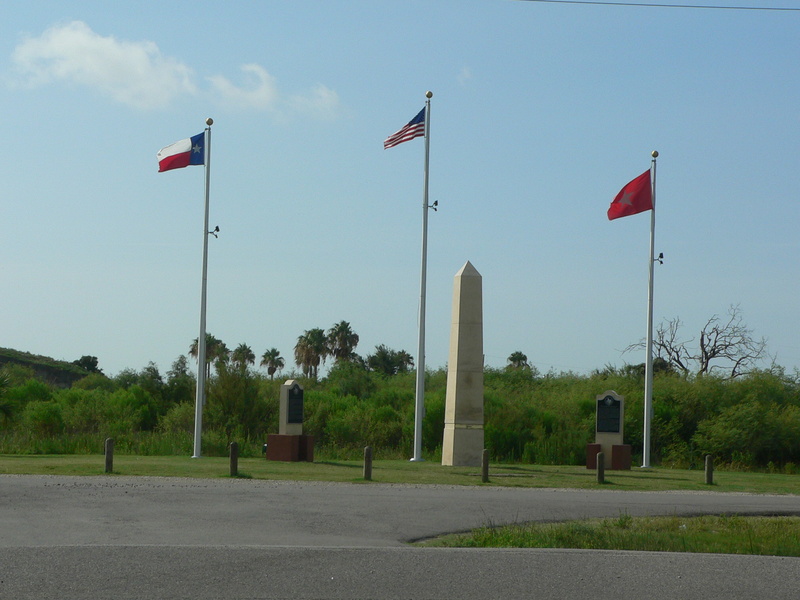 Today, the Bolivar Peninsula Cultural Foundation has dedicated a Jane Long Memorial on Bolivar Peninsula, which consists of a monument, Texas historical markers, and three flags—the United States, the Texas, and the Jane Long flag. Mississippi slave plantation in 1843, Bose Ikard moved to Texas when he was nine years old with his master Dr. Milton Ikard. The family settled in Parker County, just west of Fort Worth, where Bose learned to farm, ranch, and fight the ever-present Indians. Even after becoming a freedman at the end of the Civil War, Bose stayed with his master’s family until 1866 when Dr. Ikard wrote a letter of recommendation for Bose to work as a trail driver for Oliver Loving and his partner Charles Goodnight. Bose joined the already famous Goodnight-Loving Cattle Trail over which about eighteen men drove cattle more than 2,000 miles from Texas through New Mexico to Colorado. 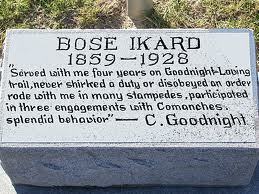 After Loving’s death from injuries in an Indian fight in 1867, Bose continued to work for Goodnight and earned his employer’s respect and abiding friendship. Larry McMurtry patterned his 1985 Pulitzer Prize-winnning western novel Lonesome Dove and the 1989- TV mini-series after the adventures of the Goodnight-Loving Trail, modeling the character Deets (played by Danny Glover) after Bose Ikard. J. Evetts Haley in Charles Goodnight, Cowman and Plainsman relates Goodnight’s account of Bose Ikard’s rugged endurance, ability as a nightrider, and skill at turning a stampeding herd. When Bose decided to leave the trail and marry in 1868 Charles Goodnight advised him to settle on a farm near Weatherford an area west of Fort Worth that continued to be plagued by Indian attacks. In 1869 Bose rode with his former master Dr. Milton Ikard in a running battle against Quanah Parker, leader of the aloof and warlike Quahada Comanches who for a decade had refused to move to a reservation. 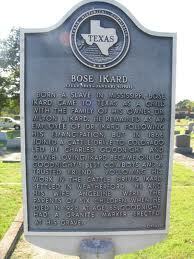 A Texas Historical marker also stands beside Bose Ikard’s gravesite. An octagonal-shaped wooden building in Waxahachie began hosting hundreds and then thousands of enthusiastic farmer families and small-town residents from all over North Texas when it opened in 1902. They came in wagons and on horseback to camp out for a week to ten days; they slept in tents and under their wagons; and for the first time in their lives they enjoyed a chance to hear humorists, watch jugglers, listen to statesmen talk of patriotism and actors read Shakespeare. Before the turn of the last century, a few Waxahachie residents reported with great excitement their travels to the famous summer adult education center on Chautauqua Lake in western New York State where they heard speakers, musicians, preachers, and scientists. Organized in 1874 by a Methodist preacher and a businessman, Chautauqua started as a training program for Sunday school teachers in an outdoor summer camp setting. It grew in popularity and soon “daughter” Chautauquas began springing up all over the United States. In the early days, the most popular lectures were inspirational and reform speeches. Over the years, the fare lightened with the addition of current events, story-telling, and travelogues—often in a humorous vein. 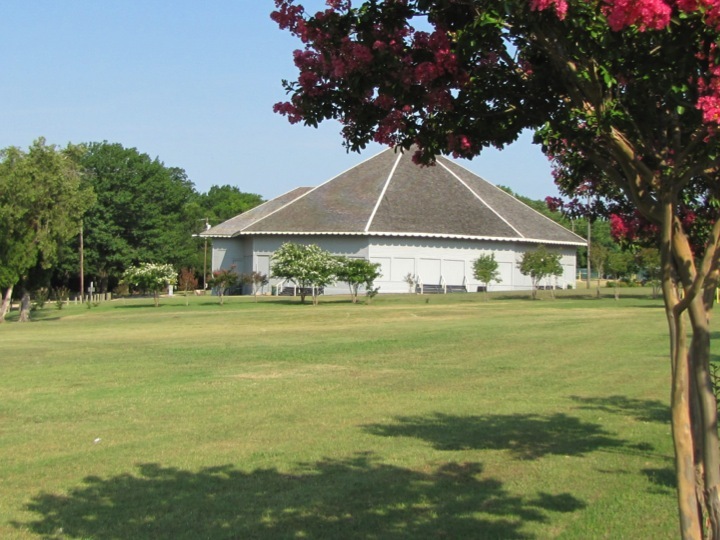 The first Waxahachie Chautauqua Summer Assembly met in 1900 in a pavilion constructed along a creek in West End Park. More than 75 tents dotted the landscape that first year. 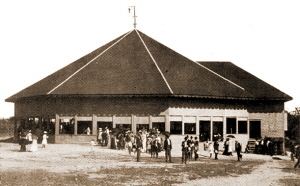 With the completion in 1902 of the 2500-seat Chautauqua auditorium, the pavilion became a dining hall. The new all-wood building, constructed at a cost of $2750, boasted large wooden windows that slid upward into the wall to create an open-air facility, which boasted electric lights. Drinking water came from a large, nearby water tank. At times crowds from 5,000 to 7,000 milled in and around the building. 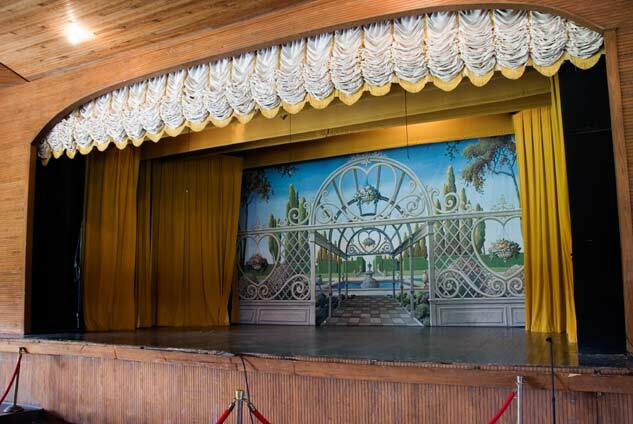 Buggies often pulled up beside the windows to offer extra seating and at least once, tents stretched out from the windows to protect the audience standing outside from the summer sun. The attendees enjoyed plenty of social life. A Chautauqua Parlor offered popular piano and vocal solos and tables set up for games of Forty-Two. The local Young Men’s Chautauqua erected a social tent complete with electric fans and ice water. Later, they added sofas and rugs. The group became known as the “matrimonial agency” because of the number of couples that met at the social tent and later married. Music brought in crowds especially when the U.S. Marine Band performed in 1914. Scottish music and the Highland Fling became a 1922 hit. The next year an electrical storm interrupted for twenty-five minutes a lecture and demonstration of electricity and the radio. John Phillip Sousa changed his schedule at the last minute in 1925 and crossed out Waxahachie on his hand-written itinerary and in its place wrote “Korsikana,” obviously meaning the lucky town of Corsicana a few miles down the road. World War I themes turned to patriotism and the war effort. A war tax boosted the new ticket price of $2.50. 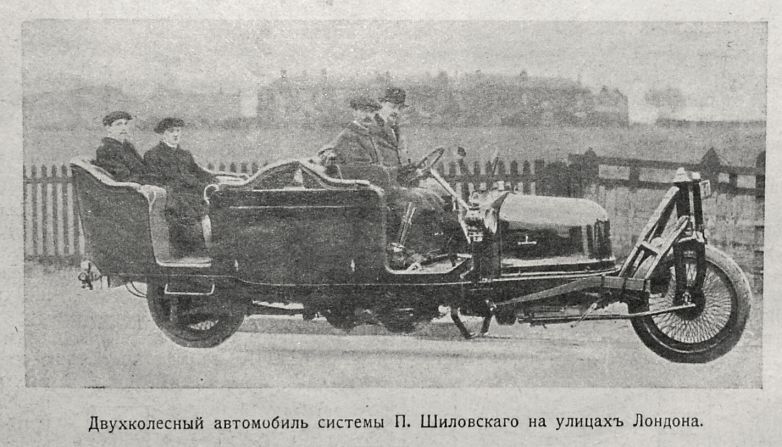 A 1918 program highlighted war inventions–two-wheel automobiles or gyrocars, airplanes with gyroscopes, ultra-violet rays, and hearing torpedoes—for a spellbound audience. Several cultural, social, and financial events—advent of the automobile, the popularity of the radio, and the Great Depression–began a slow erosion in the attendance at Chautauqua. Ticket sales declined, forcing local supporters to underwrite more and more of the Chautauqua expenses. By 1930 the Chautauqua Assembly in Waxahachie came to an end. The old building slowly declined and its door shuttered in 1971 as the city considered tearing it down. Members of the community formed the Chautauqua Preservation Society and began fund raising to restore the building. The Texas Historical Commission awarded the building a state historical marker, and it was placed n the National Register of Historic Places. In 1975, with the restoration complete, the grand old building reopened with a July 4 celebration. It serves today as a city auditorium hosting reunions, conferences, civic and educational events, and high school graduations. The Fort Worth Symphony performs several times a year. And a new generation has a visual reminder of an era when people came from miles around, eager for a sampling of the latest in culture and entertainment. AIRSHIP FLYS BEFORE WRIGHT BROTHERS? Residents in the East Texas town of Pittsburg house in the local museum a full-size replica of the Ezekiel Airship, which many old timers declare flew almost a year before the Wright brother’s claim to fame at Kitty Hawk, North Carolina. Burrell Cannon, a mechanical genius and part-time Baptist preacher, inspired by the first and tenth chapters of Ezekiel in which the prophet writes of angelic vehicles composed of wheels within wheels, worked over twenty years building models and improving his design for a flying machine. 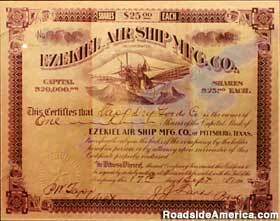 In 1901, Cannon convinced Pittsburg businessmen to establish the Ezekiel Airship Manufacturing Company and issue stock for twenty thousand dollars to underwrite the project. Employees of the Pittsburg Foundry and Machine Company built the airship between March and October 1902. Its engine turned four sets of paddles, which powered large, fabric-covered wings—incorporating a compulsion force similar to a helicopter. Local residents claim seeing the airship fly for about 160 feet at a height of ten to twelve feet. A former machine shop worker admitted that one Sunday, when Cannon and the other investors were out of town, the employees took the plane out to the field across from the shop and he flew it. All the conspirators, fearing the loss of their jobs, made a pact not to tell anyone. If the story is true, it explains why no newspaper coverage exists and why officials of the company denied the flight. 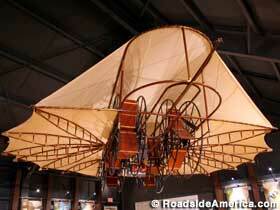 On December 17, 1903, the Wright brothers made their famous flight. The next year investors loaded the Ezekiel on a flatbed railroad car for a trip to the St. Louis World’s Fair. As the train neared Texarkana, a fierce storm blew the airship off the railcar and destroyed it. The Reverend Cannon did not attempt another flight until 1913 in Chicago when his new craft flew only a few feet, hit a telephone pole, and received damage to the bottom of the ship. The Reverend, declaring God had not willed the airship to fly, promptly gave up the project. A Texas Historical Marker tells the story in Pittsburg at Fulton and South Market streets beside the railroad tracks. Sarah Ridge survived a lifetime of tragedy before she arrived in Texas. 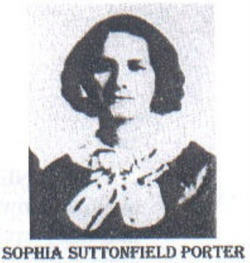 Born in 1814 in the Cherokee Nation near present Rome, Georgia, she enjoyed a privileged life as the daughter of Major Ridge, a Cherokee leader, friend of Sam Houston, and plantation owner with black and Native American slaves. Sarah attended mission schools and a girls’ seminary in Winston-Salem North Carolina—an excellent education for a woman of her time. Sarah’s father and her brother John were among the Cherokee leaders who signed a treaty in 1835 with the United States that promised to compensate the Cherokees for their rich farmland in Georgia in exchange for land in present Oklahoma and Arkansas. Major Ridge and other Cherokee leaders believed the continued encroachment of white settlers and the failure of the state of Georgia and the federal government to protect the Cherokee’s land made it wise for the Cherokees to accept the U.S. offer of financial arrangements for their peaceful removal to Indian Territory. Soon after signing the treaty Ridge and his family were among the first group of Cherokees to head west. Another group of about 16,000 refused to leave and continued a legal battle to retain their land. Finally, in 1838 President Martin Van Buren ordered the U.S. Army to round up the Cherokees, place them in temporary stockades, and march them to Indian Territory. The 800-mile journey became known as “The Trail of Tears,” as approximately 4,000 Cherokees died from abuse, starvation, and lack of proper clothing in the frigid winter. Anger and a sense of betrayal, led a group of Cherokees to assassinate Major Ridge, his son John, and Sarah’s cousin Elias Boudinot. Sarah married George Washington Paschal, an attorney who represented the Cherokees before the U.S. Supreme court as they fought to retain their land. Finally, he helped move the Cherokees west and eventually served on the Arkansas Supreme Court. Sarah bore six children before the family moved to Galveston in 1848. During the 1850 yellow fever outbreak Sarah used her knowledge of Cherokee herbs and medicinal remedies to relieve the suffering of many victims, and turned their home into a hospital. The Paschals divorced later that year, and Sarah retained their home and a dozen slaves. Sarah married Charles Session Pix in 1856 in the home, ironically, of Mirabeau B. Lamar, the former President of the Republic of Texas known for his anti-Indian policies. Sarah sold her Galveston home and the Pixes bought and operated with six slaves a successful 520-acre cattle ranch north of Galveston Bay. During the Civil War, while Charles Pix served in the Confederacy, Sarah ran the ranch. After the war the operation suffered financial decline. 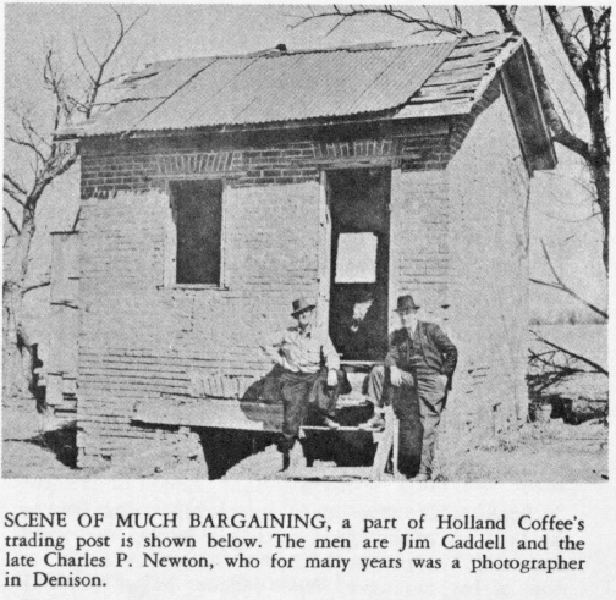 Following a celebrated trial the Pixes were divorced in 1880. Until her death in 1891, Sarah remained on the ranch with her widowed daughter and two grandsons. Her heirs still own the land. 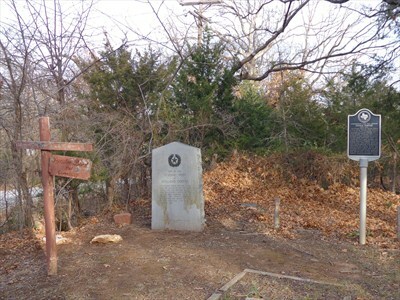 Click this site http://tinyurl.com/7n4bv4z to view Sarah’s gravestone and the Texas Historical Marker for Sarah Ridge Paschal Pix. A story, circulated since the 1830s in South Central Texas, contains enough truth to merit a Texas Historical Marker. Residents along the Navidad River bottom in Lavaca and Jackson counties began seeing strange footprints along the riverbank, and at the same time they began missing small amounts of sweet potatoes and corn. On moonlit nights half the food in their cabins disappeared even though an intruder had to step over sleeping dogs. Tools vanished, only to be returned later, brilliantly polished and sharpened. In fall around hog-killing time families stopped fattening hogs because a fat hog was invariably replaced with a scrawny substitute. Valuables such as gold or watches were never taken although they were plainly visible when the food disappeared. Everyone speculated about “it.” Slaves called it “The Thing That Comes,” thinking it was a ghost. Settlers, finding two sets of footprints, believed one of the intruders to be a man and the other a smaller companion, perhaps a woman or child. Many people organized search parties trying to capture the “Wild Man of the Navidad.” Sometimes they found his camp among the thick growth of trees, but he never returned to the site while the pursuers waited. Dobie said the rider claimed that the creature had long, flowing hair that trailed down almost to its feet and it wore no clothing. Her body seemed to be covered with short, brown hair. “As she fled to the woods, she dropped a club to the ground that was about 5 feet long and polished to a wonder,” Dobie said. Finally, in 1851, with the help of dogs trained to hunt down runaway slaves, local residents following their baying hounds found a black man in a tree. He wore no clothes and spoke no English. Some accounts say he was put in jail where he remained for about six months until a sailor wandered through who was familiar with the native dialect of the captive’s African tribe. The captive said his father, a chief of their tribe, sold his son into slavery for the price of a knife and tobacco. The new slave and a companion escaped after their transport ship reached Texas. They settled in the Navidad River bottom because of the abundance of wildlife and fruit. His companion died from exposure. 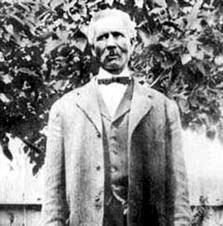 The captured man, whom they called Jimbo, was sold back into slavery and lived in Victoria and Refugio counties. Freed after the Civil War, he reportedly died in 1884.